Placing, nudging or kneading material, or finding analogues for such activities. The medium is contingent: a painting or perhaps a photograph, something halfway between a representation and its referent or the actualisation of a symbol not necessarily designed to be materialised. These are all possibilities now. This surely echoes our own joy before the object: multi-layered, image stacked upon image or objects caressed, firmly grasped or desired from a discreet distance. Take pleasure in the results of others’ activity, these things, and recognise in them our own contingency, our own analogous subjectivity. 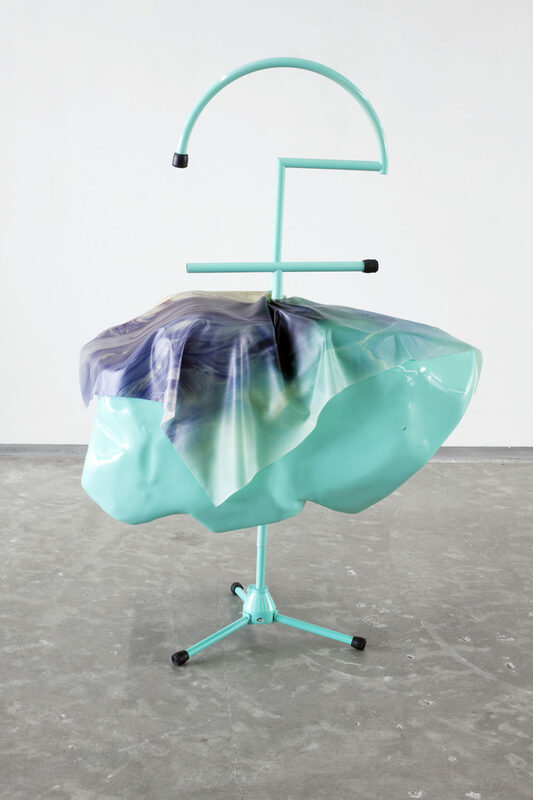 In the first room of the gallery, Anouk Kruithof’s polymorphic image-sculptures hang from the walls or are draped over powder-coated boulders. These works give form to digital images of environmental contamination, rainbows of chemicals that have spilled into the world. Printed directly onto latex the images are fluid and malleable, leading to slight variations during each installation. The picture plane has been softened and collapses into an amorphous form. 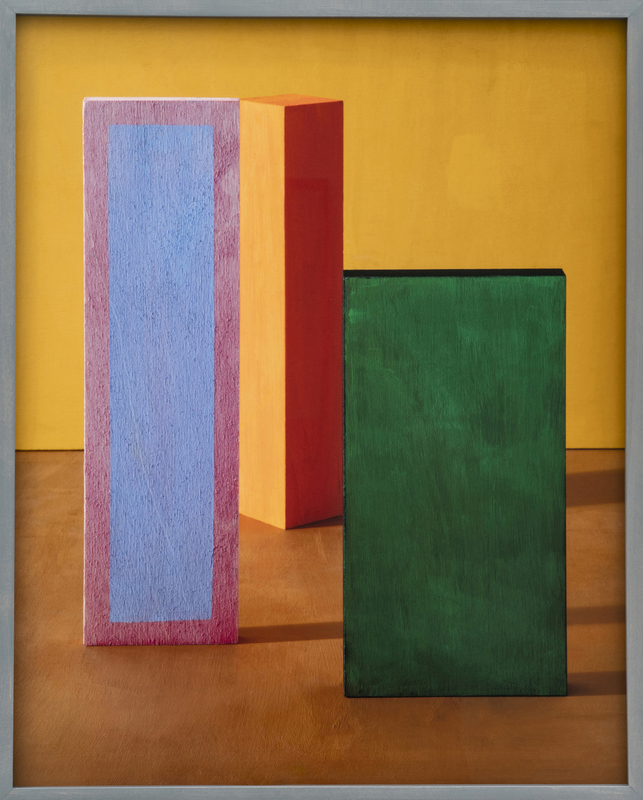 The high definition monitors of Brian Bress suggest bright photographs or paintings. Images, positioned under glass in painted frames, have their stasis broken by performances behind the screen, or activity occurring directly on its surface. Cocooned in their time-loop, figures like doughy muppets gently, doggedly, silently reformat themselves or their screen’s image. Simon Cunningham’s Duckrabbit poses the same perceptual problem as the famous two-dimensional illustration, with the additional complication of tactility and form. The ambiguous image known as the Rabbit – Duck Illusion is given substance by Cunningham as a taxidermied sculpture. It’s hard not to reach for this impossible object, turn it over in your hands, to better understand it through touch. Simultaneously one and other, the work is an inscription of difference within the same. Mutation and hybridity are consistent themes within work of Joey Holder. One room of the exhibition is given over to the display of works from her on-going project The Evolution of the Spermalege. Suspended against a backdrop of floor to ceiling imagery hang various exquisitely wrought silicon objects. 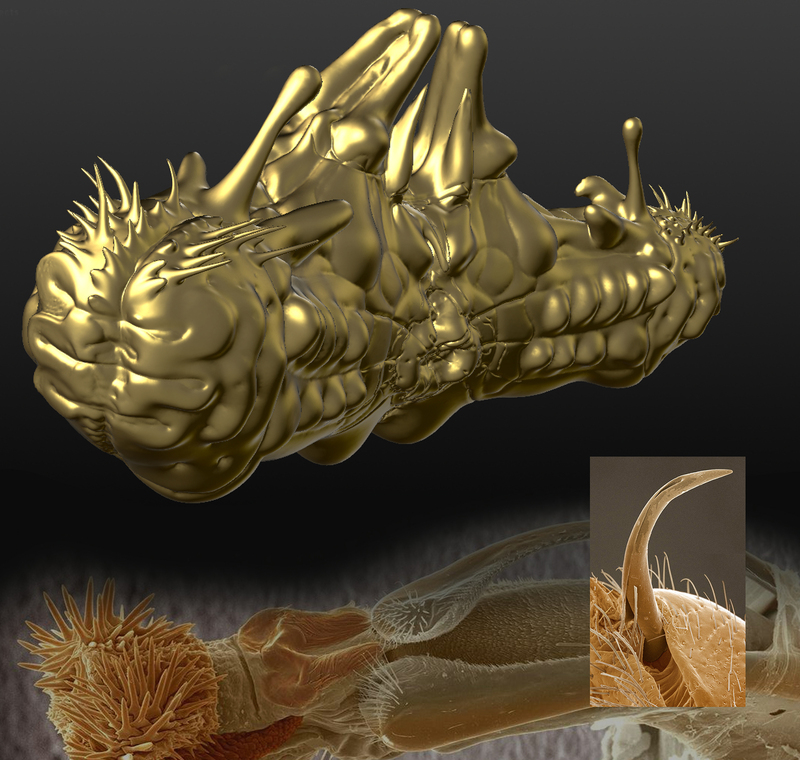 Possibly visualisations of viruses, aliens or mythical sea creatures, these works are dramatically scaled up models of insect genitalia taken from detailed 3D scans, which Holder has cast at usable human scale. Erin O’Keefe paints simple geometric shapes in rich colours, accentuated by precise lighting and shadows. Paint is roughly applied and her hand is legible in textured brush marks. The compositions initially resist and tease the viewer – the scale of the objects is uncertain and flatness and depth appear unreliable. The pleasure of colour and shadow are used against the viewer in a series of perceptual games played with brush and camera. The image enclosed in the glazed frame is an arranged tableau of painted wooden shapes, photographed to form perceptually impossible objects, the monocular vision of the camera collapsing space. Hannah Hewetson’s thin slip cast clay forms – featuring either gestural brush marks or emoji-like faces – pull away from the wall like those cellophane fortune telling fish that curl up in your palm. Hung on nails on paint-stained and rippled sheets of newsprint, the works are both delicate and physically present. It could be the residue of a child’s game, with all the spontaneity and material pleasure that that suggests, were it not for the visually sophisticated arrangements. For several decades Simon Linke has only painted images of the advertising encountered within the pages of Artforum. Tactile, impasto; physical surfaces pit oils against the precision of typography. The temporality of advertising now seems even more acute in relation to the longevity of this practice and it’s persistent nature reveals the changes that have occurred in our perception of the subject matter. Knight Landesman, speaking of Linke’s work in a 1990 interview for BBC’s Late Review, describes the adverts as “a record of important activities in any given month”. Linke’s critique of the juncture of art and business now acquires an additional layer as the exploitation of power and hierarchies within the art world has been so acutely laid bare by recent litigation. Perhaps the viewer’s relationship with advertising has evolved since the late eighties, quite possibly their consumption of art writing has changed, almost certainly their perception of Landesman will have. Richard Paul’s backlit images of paperweights use the technology of the lenticular to simulate binocular vision. Inspired by German philosopher Peter Sloterdijk’s book Bubbles, which deals with contingent and permeable containers through which the interpenetration of subjects can happen – think of magnetic fields, Mesmerism, the transfer of blood vapours in Classical Greek notions of love, breath in bubbles or sound heard in the womb. Paul’s lenticulars posit a halfway point between object and depiction, exploiting the transparent nature of the glass to suggest a perceptual slippage into the interior of these spheres. Archival pigment print mounted to Sintra. Pigment print on latex, polystyrene, fiberglass, paint, steel, rubber.